Susan wrote this entry for August 6 in The China Bayles Book of Days. This is an expanded version, with links. The Shakers arrived in New York Harbor on this day in 1774, on a ship called Mariah. They were searching for greater religious freedom and for land on which to establish separate communities. The Shakers were the among the first commercial purveyors of herb seeds and dried herbs in America. In the early 1800s, herbal medicine was widely accepted, both by physicians and by individual practitioners, and there was an increasing demand for carefully prepared herbal materials. At first, the Shakers gathered the plants in the areas where they settled--eleven Shaker communities had been established in the northeastern states by 1800—but they quickly began to exploit the potential of the pharmaceutical market. 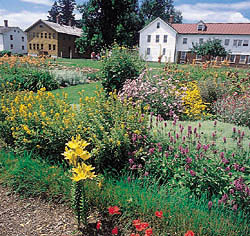 The Shaker communities became the first to grow and sell medicinal herbs on a substantial scale. Even as late as 1889, when the industry was waning, the community in Enfield, New Hampshire, reported shipping some 44,000 pounds of dried dock root, in one season, to a single pharmaceutical firm. · Bugle (Lycopus virginicus). In spitting of blood and similar diseases, it is, perhaps, the best remedy know. It is a sedative, and tonic, and appears to equalize the circulation of the blood. · Button Snake-Root (Liatris spicata). A powerful diuretic. · Golden Seal (Hydrastis canadensis) Tonic and gently laxative. Promotes the biliary [gallbladder] secretions and removes jaundice. · Gravel Plant (Epigaea repens) Diuretic . . . . Has often cured where the catheter had to be habitually used. · Pleurisy Root (Asclepias tuberosa) In all inflammations of the chest this is an invaluable medicine. It is sudorific, anodyne and expectorant. In addition to growing and selling dried herbs, the Shakers also produced and marketed a variety of medicinal preparations, and by the 1880s, some eighty different proprietary medicines were being sold. They were also widely known for their simple furniture and for the home-spun fabrics produced from the flax they grew in their fields and the sheep they raised on their pastures. Their crafts--among them the distinctive Shaker boxes, have lasted to this day. The Shaker diet was simple. Vegetables and herbs were grown in the village, dairy cows gave milk to drink and to make butter and cheese, and cattle and sheep provided meat. Shaker recipes are usually simple, delicious, and healthful, like this gingerade drink. The herbal medicine business declined steadily after the Civil War, as did the appeal of the Shaker religion. But because the Shakers kept careful records—community journals were required by rule, and business documents were rigorously maintained—we can still see and marvel at their wide-ranging efforts to build a better life, not only for themselves but for others. ’Twill be in the valley of love and delight. Hi Susan, I've always been intrigued with the Shakers because of their way of living. I love visiting the Hancock Shaker Village in Pittsfield, MA. The buildings and gardens are wonderful - I especially like The Round Stone Barn. Thanks for such a detailed entry about The Shakers! I stumbled upon this site as I was in the process of doing some online research. The simple lines in Shaker furniture have recently attracted me. I know nothing about the religeous beliefs of the Shakers but at least they semm to be in tune with mother earth. Whatever became of them? Want to read a good book?